P.m. molinae: Both adults brown crown to nape with green tint; bright green cheeks; pale brown chest barred with either grey/white or dull yellow near centre of breast, with feathers tipped brown; brown/red abdominal patch; scattered blue feathers on hindneck, sometimes forming faint collar; brown/red tail tipped with blue. Bill brown/grey. Eye ring bare and white. Eye brown. P.m. phoenicura: Both adults as in molinae, but with base of tail green. P.m. restricta: Both adults different from molinae by having brown/grey breast with white barring; green cheeks with blue tint; very visible blue collar on hindneck; strong blue wash on flanks and undertail coverts. P.m. sordida: Green morph-both adults as in restricta but with barring on chest barely visible; yellow wash on centre of breast; blue wash on flanks and undertail coverts minimal or absent. Yellow morph-both adults have green cheeks turning yellowish towards back; yellow/white breast, barred with brown; centre of abdomen has orange/red patch; yellow flanks and thighs; yellow undertail coverts with blue suffusion; green rump and upper tail coverts with yellow markings; brown/red tail with blued tips. Bill brown/grey. Eye ring bare and white. Eye brown. P.m. australis: Both adults paler in general than molinae; brown/red abdominal patch more extensive; dull yellow wash in centre of breast. Smaller bill. P.m. flavoptera: Both adults as in molinae, but with orange/red bend of wing and carpal edge; alula with blue and yellow/white feathers mixed in. P.m. molinae: As in adults but with no brown/red abdominal patch, may be replaced by scattered brown/red feathers. Tail shorter. Calls made in flight are rapid and repeated notes, the second note of which is lower in tone; also sharp or melodious sounds made. 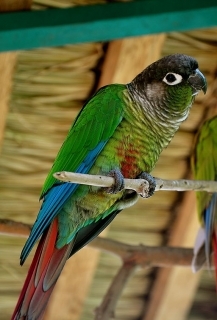 A Guide to Popular Conures, Dorge and Sibley, 2001. Unknown until the 1970s; now fairly common. Fruits such as: apple, pear, banana, cactus fruits, pomegranate, forming about 30 percent of diet; vegetables such as: carrot, celery, green beans and peas in the pod; fresh corn; green leaves such as: Swiss chard, lettuce, sowthistle, dandelion, chickweed; spray millet; small seed mix such as: canary, millet and smaller amounts of oats, buckwheat and safflower; soaked and sprouted sunflower seed; cooked beans and pulses, boiled maize and complete pellet. Are avid bathers; provide fresh water daily. Are very active so provide foraging toys, swings, ladders, bird-safe (unsprayed) wood chew toys, vegetable tanned leather toys. Vertical box 12" x 12" x 18"(30.5cm x 30.5cm x 46cm). Probably declining in E Bolivia because of rapid forest clearance. P.m. molinae: Highlands of E Bolivia. P.m. phoenicura: S Brazil and NE Bolivia. P.m. restricta: Santa Cruz, E Bolivia. P.m. sordida: S Brazil and NW Paraguay. P.m. australis: S Bolivia and NW Argentina. P.m. flavoptera: Cochabamba-La Paz border, N Bolivia. Seen in dense, low forests and woodlands with glades, primary and secondary, including fringes of chaco, savanna, deciduous and gallery woodland in pantanal. Also in moist, mossy cloud forest on E Andes where seen up to 2900m (9512 ft). Dry seeds, flowers, fruits, berries and nuts. Gregarious outside breeding season. Seen in flocks of 10-20 individuals and more. Forages in tree-tops. Nest is in hollow tree. 4-6 rounded eggs, 24.0 x 19.5mm (0.9 x 0.7 in).